Description of "Global Digital Signage Market Size, Industry Analysis and Statistics Report, 2012 to 2020 (eBook)"
The global digital signage market is anticipated to develop over the forecast period. The advertising segment has witnessed big changes over past few years. Conventional advertisement methods which include print media are facing challenges and are slowly declining due to interactive graphical user interface advertisements on web, digital media such as digital signage and mobile. 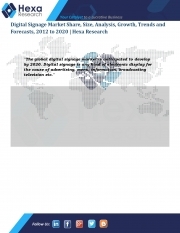 Reviews of "Global Digital Signage Market Size, Industry Analysis and Statistics Report, 2012 to 2020 (eBook)"